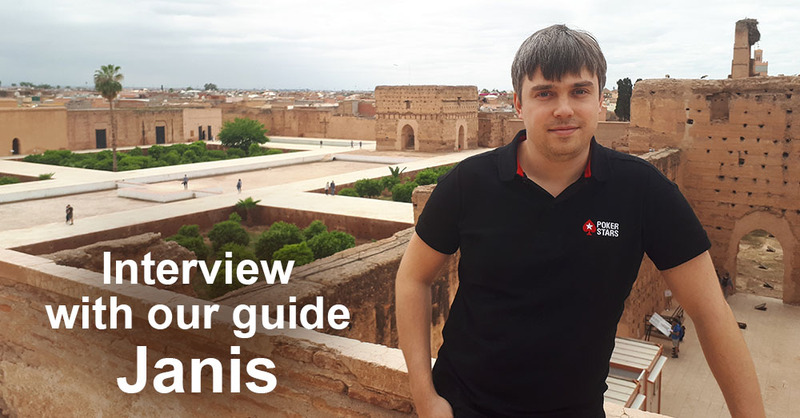 We have prepared for you another interview with our guide Janis, who will tell you a little about himself and share some impressions about the time spent with foreign students on various trips and events. Learnrussian: Hello! Could you tell us a little about yourself, your hobbies and interests? Janis: My name is Janis, I accompany the students on trips as their guide. I am also responsible for sports events in the program, and I pride myself on being a friend to all of the students as well. My main hobby is travelling to countries near and far. I enjoy experiencing new cultures and people. Other than my loved ones, there is nothing more important to me in life than gaining new perspectives through traveling. When I travel, I like to pay special attention to nature, history, and architecture. I like to examine the way different cultures have a unique way of living, and contrast their ideals to those of mine, gaining new insight and information as I travel through different countries and cities. Learnrussian: What attracted you to work with foreign students? Janis: Being in contact with students, I am able to learn a number of things, as well as expanding my range of interests, as engage in physical activities and sports. Learnrussian: Do you like your job? Janis: A lot! It is interesting, I learn a lot about other cultures and countries. Learnrussian: What challenges did you face in your work? Janis: The only difficulty is when students are passive and unresponsive, when they are not interested in any of the event or activities offered by the project. Learnrussian: Do you always manage to establish contact with foreign students? Janis: Yes, almost always. We always have a lot in common – topics for conversation, sports, travelling, movies and shows. Since I am not a teacher, our communication with students is more informal, we very often become friends, something that means a lot to me. Learnrussian: Could you tell us how foreign students change during your time with them? Janis: Their range of interests expands dramatically. They learn about our culture, history, and lifestyle. The opportunity to study and live abroad is the acquisition of a new perspective, and experience, which can help you look at the world in a different light. Learnrussian: Have you learned something from international students during the time spent with them? Janis: Sure. We communicate in a very friendly way, and we enrich and expand a circle of interests for each other. The main thing is that we learn about each other’s cultures in the ways that are difficult to describe. We learn various funny or slang expressions since we are able to communicate on a platform outside the formal classroom environment. We are able to share unique foods and perspectives, have discussions about the world and about sports. We become friends through our differences, but then strengthen the bond through our shared similarities as well. Learnrussian: What would you like to wish or advise to our international students? Janis: I strongly recommend them to be more active and make the most of their time, not to stay home on the Internet or social networks, but participate in local life, as much as possible. It is integral that they immerse themselves into the international environment by participating in sports and cultural events, travel, communicating with local residents. Learnrussian: Thank you very much for the interesting interview. We wish you further success in your work!